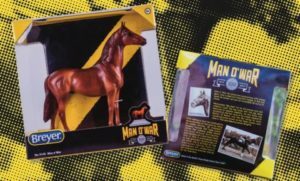 Home » Model Horse	» Kentucky Horse Park Breyer Special Run Man o’ War! Kentucky Horse Park Breyer Special Run Man o’ War! First we had the Breyer 2017 Collector’s Club Scotty. Last weekend we had the excitement of the Kentucky Derby. 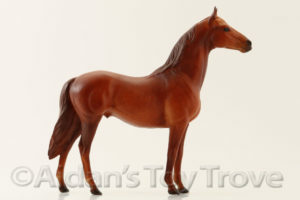 And NOW we have a brand new Breyer Classic Special Run to look forward to. He is the famed Man o’ War and is of course on the Man o’ War mold in a glowing chestnut. While I love the original Classic Man o’ War, this guy takes the cake color wise. His shading is fantastic! I’m beyond excited for this model horse! Just for fun, I included a picture of the original Breyer 602 Man O’ War. There is a distinct difference in color. 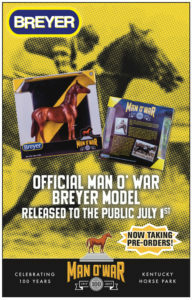 The official Man o’ War Breyer model will be released on July 1, 2017. The Kentucky Horse Park gift shop is taking pre-orders beforehand and will stock them while supplies last. “Big Red” won an incredible 20 out of 21 races in his career, and we’re celebrating his 100th birthday all year long in 2017. To pre-order yours, please visit the Kentucky Horse Park gift shop in person or call 877-711-2110 or 859-259-4234. 2 Responses to Kentucky Horse Park Breyer Special Run Man o’ War!